Someone once told me that idle minds breed idle thoughts. Despite rotting underneath a lot of work, my mind has been pretty idle lately. Apparently though, the evilest my mind could get was to get itself lost in the aging Asian videos and novellas in Youtube. Do you remember those days when Filipinos of all ages and orientations swooned over those beardless, monotoned, emotionally challenged pretty flower boys from Taipei? I never really got into the craze because logic and two decades in a library filled to the brim with stuffy, constipated ancient Western philosophy forbade the enjoyment of pop culture. Now that my library in Alexandria has sunk 20,000 leagues under the sea and has been replaced by the endless struggle for survival in a paradise for capitalists, I have finally realized that pop media and culture truly are balms for folks under tedious yolks. Having been detached for so long from this reality, I needed hours to catch up with whatever was hip 4 or 5 years ago. What did I learn? I found out that one of the F4 was a former waiter while another one was an engineering student. They probably feel that trading highlights and footlights for a tray or a T-square just isn’t cool because after so many years, they’re still alive and doing the same thing. Obviously though, these boys are on the brink of showbiz middle age. Although they still show no signs of receding hairlines hidden under ball caps like Donnie Wahlberg of New Kids on the Block, the fact that they now have hairier armpits and locks that no longer look like they were treated on their mothers’ ironing boards (and secretly carry high class sophisticated million dollar lice) show that they are nearly old enough to release a “Best Of” album and to carry silver tipped canes on a reunion concert. 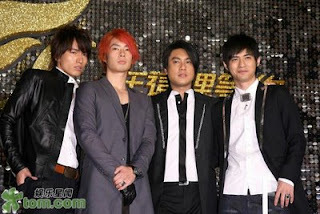 I also found out that Meteor Garden was not an original concept. It was borrowed from a Japanese manga whose creator had probably writhed in agony over the fact that no one cared that it was his idea. Japan now has its own version of the story but apparently, their leads are less smooth, hairless and metrosexual than the original F4 because very few are swooning. awa kung kinsay kugihan ay. hahah. nindot na kaayog theme o. i simply love it. nainspired raman ko sa imo blog mao nag change ko design. but i still can't figure out the header though. do mugawas akong google ad banner unless ako i-modify ang code which is so super bawal. oh well.